I bought this beauty on Monday and just about finished reading it. 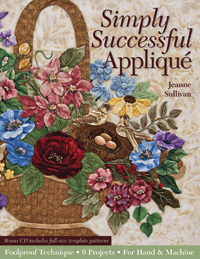 What a spectacular book on applique! Simply Successful Applique by Jeanne Sullivan (I found it here) presents a comprehensive description - with very detailed photographs - of her applique method. I have not yet had the pleasure of being taught by Jeanne, although I felt as if we were in the same room as she, patiently, introduced me to her techniques. This very well written book walks you through every imaginable detail of the applique process, from the necessary tools in your arsenal to turning that pesky little corner in a V-shaped applique piece so when you stitch it, it will look perfect. Unlike other works I've read before where the author briefly introduces the reader to a technique before featuring his/her projects, this book is truly a HOW-TO book as the entire book is dedicated to making sure you understand every aspect of her techniques. Expect to be excited and not bored! This 2012 book includes a CD with patterns which I haven't checked out yet as I am trying to finish Christmas projects. After all that eye-candy (the photographs on each step, as well as the gallery depicting applique executed by others but based on her patterns, are gorgeous! ), my fingers are itching to start on a project... I wanted to have seen more of her own projects, though, and will go to her website to feast on them as soon as I have a chance. Have you read this book? If you love applique and want to improve your work, this IS the book for you! I have never done applique and your review sounds like it is just what I need to begin. It is nice when someone recommends a book. Thank you.